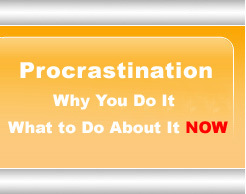 We are pleased to present links of interest to those wanting to learn more about procrastination. Procrastinus.com offers research updates and discussion boards. procrastinators-anonymous.org is an online support group, with tips, discussions, and a weekly meeting.